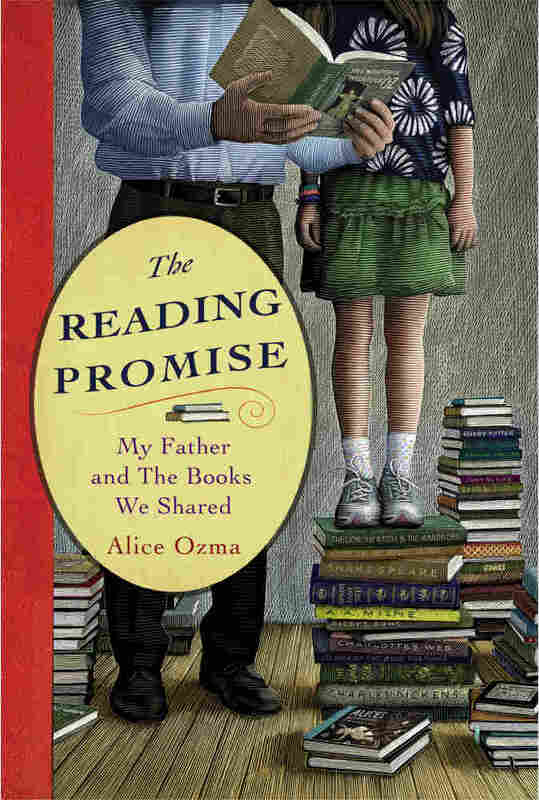 Father-Daughter Reading Streak Lasts Nearly 9 Years When Alice Ozma was 9 years old, her father made a promise: to read to her every night for 100 nights. But once the pair met their goal, they didn't stop. The Reading Streak lasted 3,218 days — and finally ended on Alice's first day of college. When Alice Ozma was in the fourth grade, her family was going through a rough patch. Her parents had just split up, and her older sister had recently left for college. Ozma was suddenly spending a lot more time alone with her dad, Jim Brozina, an elementary school librarian. So Ozma and her father made a pledge: to read together every single night for 100 days. But after 100 days, they just kept going. Their streak ultimately lasted 3,218 days — spanning from Ozma's fourth-grade year to her first day of college. Their commitment to reading and to each other are the subject of Ozma's debut book, The Reading Promise: My Father and the Books We Shared. Brozina and Ozma join NPR's Scott Simon to talk about what kept their "Reading Streak" alive. The nightly reads quickly became habit, Ozma explains. "I think that once you start something like that, it's very difficult to stop; it seems very weird after 100 nights of reading in a row to say, 'Let's not read tonight.' "
The streak was a source of stability for the pair through difficult times. "I did everything I could to make things be as comfortable as possible," Brozina says. "We went through a very rough patch for a few years ... it was almost scary, the situation we were in financially." Reading together was one thing they knew they could depend on. As Ozma got older, it got harder to keep it up, but the pair persisted — even on the night of Ozma's prom. "Before I went out, I had my hair in my up-do and my fancy dress on," Ozma recalls. "And I just sort of climbed into the bed next to him and he read to me. That's what had to happen." JB: When Zachary Beaver Came to Town by Kimberly Willis Holt. "[A story] about two boys who don't have a dime and they try to patch together an interesting summer. That certainly resonated with me." AO: Great Expectations [by Charles Dickens] "was really big for me. The plot was really nice but also just the wording was beautiful. We read a couple of Agatha Christie books and I ended up reading probably 20 or more ... on my own because I liked them so much when we read them together." For Brozina, the hardest part wasn't maintaining the streak — it was ending it. Ozma was heading off to college at Rutgers, and it was time to bring the nearly nine-year tradition to a close. On the last night, Ozma chose to read from the same book they'd read for their first father-daughter reading: The Wizard of Oz. "That was the single hardest thing to do," Brozina recalls, "to read, choked up, tears in eyes — both of us. That was the most difficult, to stop it." His daughter is all grown up and he has retired from his job as a librarian, but Brozina has still found ways to read aloud. He's accumulated a large picture book collection. "I take them to senior citizens homes and to three schools," he says. Want To Start Your Own Streak? Today, Brozina and Ozma are encouraging a new generation of families to make their own reading promises. (You can find suggestions for starting a streak on Ozma's website.) "I don't think fathers and daughters are spending time together every night," Ozma says. "This is a generation of very, very busy kids." But all it takes is one night ... followed by another night ... and another ... and another. And if your family is anything like Alice Ozma's, the hardest part of your reading streak will be bringing it to an end. It started on a train. I am sure of it. The 3,218-​night reading marathon that my father and I call The Streak started on a train to Boston, when I was in third grade. We were reading L. Frank Baum's The Tin Woodman of Oz, the twelfth book in the beloved Oz series, a few hours into our trip. The woman across the aisle turned to us and asked why my father was reading to me on a train. We simply told her that this was what we always did — he had been reading to me every night for as long as I could remember, ever since we read Pinocchio when I was four. Being on vacation didn't make much of a difference. Why not read? Why not always read? But her surprise made us think. If we were going to read on vacation anyway, how hard could it be to make reading every night an official goal? I suggested to my father that we aim for one hundred consecutive nights of reading, and he agreed to the challenge. This is how I remember it. If you ask my father, though, as many people recently have, he'll paint an entirely different picture. "Lovie," he tells me, as I patiently endure his version of the story, "you're cracked in the head. Do you want to know what really happened or are you just going to write down whatever thing comes to mind?" Lovie, as I'm sure you can guess, is not my real name. Alice is, but only sort of. My full name is Kristen Alice Ozma Brozina, but I don't care for Kristen. Alice and Ozma are names my father chose from literature, names I would later choose for myself. It's a decision that took a long time, but one I'm very happy I made. Those names always felt like my real names to me, as I'll explain later. Also, Lovie is not the affectionate pet name you might think it is. As are all things in my father's vocabulary, it is a reference to something — this time it's Mr. Howell's nickname for Mrs. Howell on Gilligan's Island. My father never calls me by my name; Lovie is his most commonly chosen alternative. But when I drop something, or forget something, or do any of the silly things we all manage to do on a regular basis, "Lovie" is often followed by phrases such as "you nitwit!" "So tell me then," I say, standing in his doorway as he gets ready to run errands. "Well, when did Mom leave?" he asks. "All right, so 1997 it started. The Streak was a year old when she left." "And what were we reading?" "Well," he says thoughtfully, "it had to be an Oz book. That's what we were into around that time. I wanted to try other things, but you were set in your ways." So far, we agree. But I know this won't last long. "We were on the bed, we'd just finished reading," he says, "and I was fearing the Curse of Mr. Henshaw." "Dear Mr. Henshaw was the book I was reading to Kathy when she asked me to stop reading to her," he says in an almost whisper. It is clear that this memory, though nearly two decades old, still troubles him. My sister was in fourth grade when she said she no longer wanted my father to read to her. It seemed childish to her, especially since she was already reading novels on her own. But it wasn't so easy for my father. He was an elementary school librarian, and reading to children was what he liked to do best. And maybe next to being a father, it's also what he does best. His soothing voice and rehearsed facial expressions have won over thousands of children throughout his career. They won me over, too, but I was already on his side. "For some time, I'd been planning to suggest to you that we do a streak, because then at least you'd be a little older when we stopped reading together. I brought it up, and honest to Pete, I thought you were going to say we should read a hundred nights in a row!" He laughs as he recalls this. I don't laugh because I think I did suggest a hundred nights in a row. Initially. "No," he continues, "Right away you said, 'Let's do one thousand!' And I had to pretend to be enthusiastic, of course, but I wasn't too optimistic. One thousand nights is a long time." I have to stop him there. None of this sounds right to me. First I remind him that our goal had been one hundred nights. When we reached that goal, however, and celebrated with a pancake breakfast at the local greasy spoon, we decided to set a new goal. We skipped the discussions of lower options, from two hundred to five hundred, and ultimately decided to try for one thousand nights. I tell him this, but he just shakes his head. When I try to explain that The Streak actually began on the train, he cuts me off. "Ah, the Curious Incident of the Train in the Nighttime!" he says, adapting the title of one of our favorite Sherlock Holmes stories. "I remember that part clearly," he continues, "because I never miss an opportunity to brag about what a good father I am. We were on the train to Boston, going up to see the sights for a weekend, and the woman next to us said how sweet it was that I was reading to you. I told her right away that we were on a streak, forty nights in! I was pleased with myself, absurdly pleased with myself, pleased as a peacock to have made it forty nights."